St Helens Cricket Ground, where Glamorgan beat the Australians in 1964, and 1968. Let no one doubt the cricketing fervour of the Welsh, least of all the Australians, as they gather in Cardiff today for the first Test Match in the 2015 Ashes series. When Glamorgan beat the Australians in Swansea in 1964, and it was the only the second time the tourists had been defeated by a county side, the crowd erupted as they might have after a win by Wales over England at Cardiff Arms Park. “Glamorgan won by 36 runs amid tumultuous scenes by an excited and jubilant Welsh crowd”, noted Wisden. In those days all true Welsh fans would switch sports quite naturally with the changing seasons, from rugby in the winter to cricket, following Glamorgan, in the summer. There was no question of preferring one sport to the other. The Welshman’s passion for rugby and cricket was in equal proportion, and all consuming. “Ah”, you might be inclined to say. “But at Swansea that day they were supporting their own.” Hardly. In 2013 the Welsh crowd sat, intense and passionate, urging on England against Australia, through a breathless final session as the final England batsmen held on for a draw. There may be some misguidedly patriotic zealots in the crowd want Australia to win, but they’ll be missing the point that the England team, chosen from 17 English counties and Glamorgan, has always had a wider meaning. Irishman, Scotsman and Welshmen have played for, and captained, England down the years. The England and Wales Cricket Board recognised that Wales, through the commitment of its spectators and quality of ground facilities in Cardiff, was a suitable venue for test match cricket in 2009, when it hosted the first Test Match against Australia. 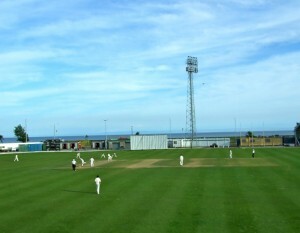 Before then Glamorgan’s games against the tourists were seen as an official test matches. Huge crowds would gather for the fixtures, often staged over the August Bank Holiday weekends. In 1948, 50,000 people were at Swansea for the game with Don Bradman’s Australians. Another huge crowd saw Glamorgan beat the South Africans in 1951 after the tourists suffered a dramatic collapse after tea. Then Glamorgan beat the Australians on consecutive tours, in 1964 and 1968. I was there on the first day, when the game turned dramatically in Glamorgan’s favour. The home side batted first on the spin-friendly pitch. This had been a challenging place to play cricket for 100 years or more, due to the nature of the quick-drying sandy soil under the pitch. After Glamorgan made 197, the home team’s spin bowlers reduced Australia to 21 for five. One of my strongest memories of big hitting cricket is of Australian spin bowler Tom Veivers smiting six after six that Saturday evening, while his partners fell like skittles the other end. “Veivers scored six sixes in his daring 51, but despite his assault Glamorgan claimed a valuable lead of 96,” said Wisden. On the August Bank Holiday Monday a crowd of 20,000 saw Glamorgan consolidate its advantage in “an intense atmosphere one usually associates with a Welsh rugby international.” The visitors limited Glamorgan to a score of 172 all out, and set off to score 269. Four years later. Glamorgan repeated the feat, with Don Shepherd leading the side. Just three weeks later, on the same ground, Garfield Sobers became the first player in cricket history to hit six sixes in an over.